"This is a terrific announcement on so many levels. It shows that what I've been saying about Micron for years now is absolutely true – this is a state-of-the art company constantly on the cutting edge of advanced memory systems," said Money Morning Defense & Tech Specialist Michael A. Robinson. The stocks of both companies reacted positively. INTC stock closed yesterday up 2.15% to $28.96, although Intel was down slightly in morning trading today (Wednesday). Micron stock shot up 9% to close at $19.75 and gained another 3.5% this morning. The discrepancy makes sense. Because Micron is a much smaller company – Intel's profits are about five times that of Micron – MU stock figures to get the heftier benefit. 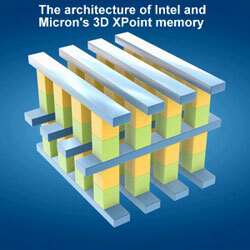 The companies have been developing the 3D XPoint (pronounced "cross-point") technology since 2012, although the Intel-Micron partnership dates back more than a decade. Executives from both companies emphasized that the 3D XPoint memory is an entirely new class of memory that doesn't use transistors. It's distinct from the NAND flash memory used in smartphones and the solid state drives (SSDs) in PCs. It also differs from the faster, more expensive DRAM memory used in PCs. While slightly slower than DRAM, 3D XPoint memory will be cheaper than DRAM, the companies said, and 1,000 times faster than NAND. And like NAND, the new Intel-Micron memory is non-volatile, which means the data does not vanish when the device it resides in is powered down. So 3D XPoint memory will create its own niche in the $78.5 billion global memory market – a position that should prove to be very lucrative. "As far as being in the memory business, it's good to have something other people don't have," said Rob Crooke, senior vice president and general manager of Intel's Non-Volatile Memory Solutions Group. Several applications for 3D XPoint leap to mind. The most obvious is for smartphones and tablets, which would get a huge performance boost by substituting this new type of memory for NAND. Better still, the first 3D XPoint chips are a robust 128 GB. Gaming and the SSD market are other areas that could benefit from 3D XPoint's high speed. I have owned INTC several times and it is a consistent loser. I see no reason to think it will be nothing but dead money for a long time.